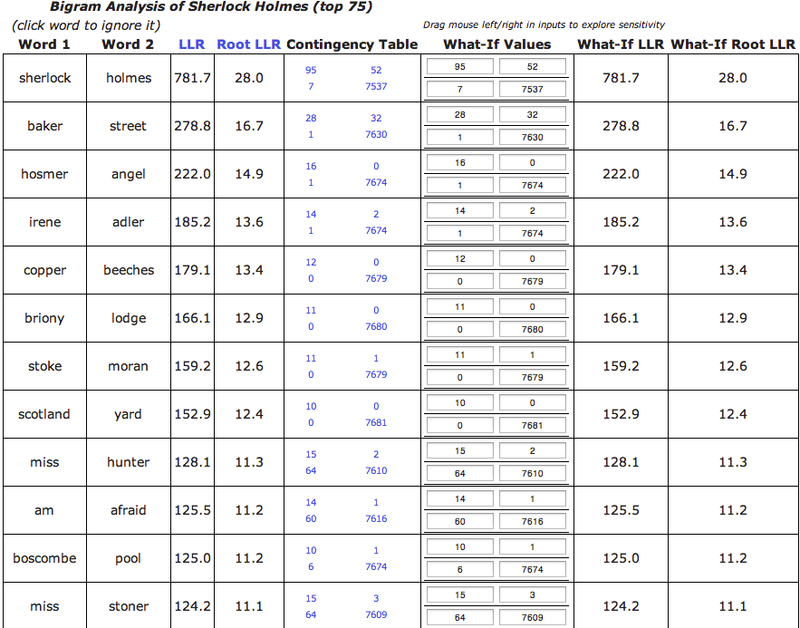 I have been playing with a simple online tool that will take a text document and calculate the log-likehood scores for all of the bigrams in the document, and generate the sorted list. One of the things I wanted to be able to easily do is explore the sensitivity of the calculated log-likelihood scores on the entries of the contingency matrix for each bigram. This feature has been added and the tool updated. For exploring the impact of changes to a contingency matrix, you can either manually enter specific values in one of the contingency tables, or drag your mouse left or right on a specific entry in order to decrease/increase the values. 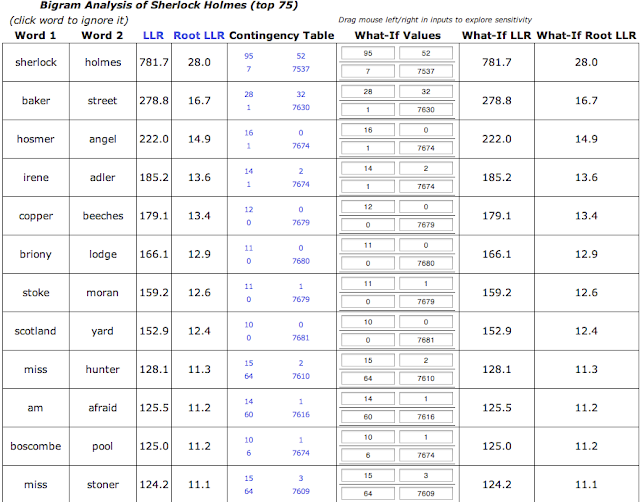 and the log-likelihood score is calculated from the terms k_11, k_12, k_21, k_22. The "exploring" involves watching the impact of changes in the values k_ij. At the moment, you can only increase/decrease a particular entry. However, in reality there are additional changes that are of interest; namely, keeping the total number of bigrams constant when changing a particular value k_ij, so that there has to be a corresponding change in the other value(s) when k_ij is changed. In fact, because of the lack of this restriction, it may be the case that you end up with a contingency matrix that could not occur for bigrams in a document. There is much more to explore here.